There was one television in our cabin with a built-in antenna that picked up a lot of static but very few stations. Other than a radio that could receive local stations and Ernie Harwell calling Tigers games on WJR from Detroit, we were cut off from the outside world. No handheld video games. No internet. No smartphones. When we needed civilization, we might take a quick car ride to the bakery in Hessel for some amazing donuts or to the Red Owl grocery store. My dad also would load all of us into our rented boat and take us to the Bon Air shop in Cedarville where we would eat ice cream and I would supply myself with comic books and candy. Other than these brief flirtations with civilization, my siblings and I were forced to entertain ourselves by fishing, swimming, water skiing, catching crayfish near the dock, taking a rowboat out into the marshes, running through the woods and playing hide and seek while swimming under the docks. At night we would eat the fish we caught during the day, pop some Jiffy Pop on the stove, and play card games, or we would have a bonfire and roast marshmallows and hotdogs. Before I was old enough to waterski or fish for pike, the most thrilling moment was when my dad would steer our boat through a channel that he called Danger Pass. As we approached Danger Pass, sometimes he would let me steer. I never understood why it was dangerous, but the name alone caused me to grasp the wheel with such force that my knuckles turned white. I do not know if my dad drove slowly because of wake restrictions or to make the ride more dramatic, but I always was on the lookout for crocodiles, swamp monsters, pirates and unknown threats that I was too afraid to imagine. Even when I was too old to be scared of Danger Pass, I would still ask my dad to let me slowly pilot the boat to safety, knowing that he enjoyed these moments as much as, if not more than, I did. I never have loved fishing as much as I did in the U.P. My earliest memories of fishing were at private dock we called Doc Diamond's. I still am not sure if we had permission to use this property, but my dad would take us across the bay and tie our boat to Doc Diamond’s dock. The dock had a boathouse attached with several windows that let sunbeams pierce the dark water inside. We would fish from the dock, but my favorite spot was inside the boathouse. The rock bass inside the boathouse were the easiest prey for a young fisherman. The sunbeams coming through the windows acted as spotlights on the schools of tiny rock bass swimming below the surface. My dad would hook a worm onto a line connected to an old bamboo fishing pole, and I would watch the fish swimming in the sunbeam until I found the one I desired. I then would drop the worm in front of the fish and watch it quickly latch onto the hook. 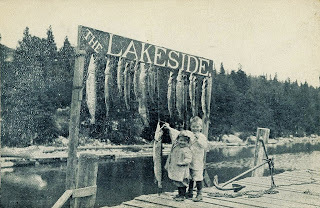 In one swift motion, I would yank the poor fish up onto the dock, proudly displaying my catch to my parents and siblings. When I was old enough, I was allowed to go on the early morning pike-fishing excursions with my parents. I thought trolling for pike in the cool early morning mist was boring, until the first pike hit my line and the struggle to reel in the fish began. The first time I caught a pike, I did not believe a fish could fight that hard. The rock bass at Doc Diamond's should have been ashamed by the ease in which they were caught. This pike was not going to surrender that quickly. I felt that for every inch I took, the pike took two. That first pike was testing my will, but after our game of tug-o-war was over, I proudly pulled the pike into the boat. Even though I have not done any serious fishing in years, I still treasure the one year that I had the honor of pulling in the biggest fish of our summer trip, a 38-inch pike. My parents and brothers caught bigger pike over the years, but that summer will always be mine. It has been years since I have been to the U.P. I miss driving over the Mackinac Bridge, the cool waters of Lake Huron, and the tree-shrouded shorelines of the Les Cheneaux Islands. I hear the Bon Air is gone, and I’m sure most rental houses and cabins have cable or satellite television now, but the woods are still there. The water is still there. I can't speak to the rental cabins but our cottage still has no cable or satellite. Of course, we only got electricity for the first time in 1996 so we're happily a bit more primitive than most. The area has indeed changed some but you should go back. It's still heaven up there. Kristen, thank you for the comment. I hope to get back up there soon. 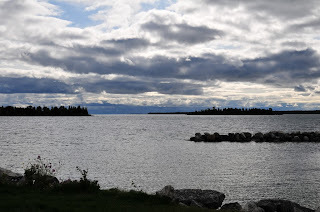 A friend of mine recently posted pictures of her summer trip to the Les Cheneaux Islands on her Facebook page. It still looks beautiful. Really nice article, and nice pic looking out across Hessel Bay...thanks! Thank you for the kind words. I cannot take credit for the photo though. Last time I was there, we did not have digital cameras. I was thinking of scanning some family pics, but this photo was stunning.